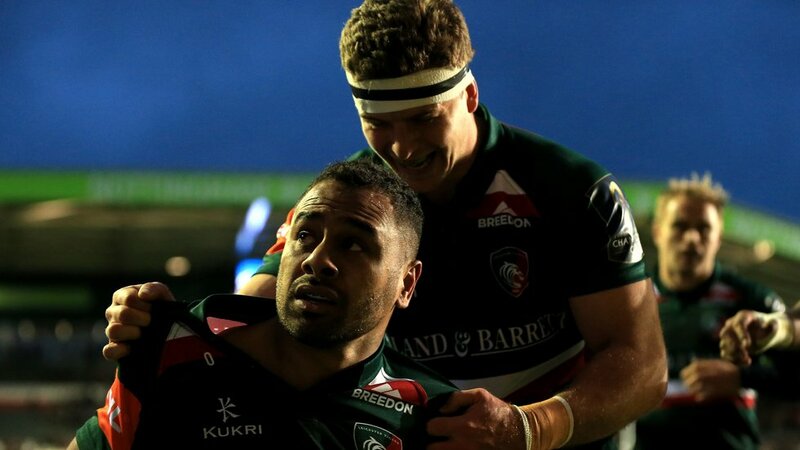 Leicester Tigers ran in seven tries in a 54-29 bonus-point win over Castres Olympique in Pool 4 of the European Champions Cup at Welford Road on Saturday. Tigers claimed a first-half bonus point in the first-ever meeting of the two teams with tries from Telusa Veainu (2), Jonny May and Ben Youngs. And Veainu completed his hat-trick on 50 minutes with May again on the mark in the second half to go with a score from Nick Malouf. But the visitors, who opened with a draw against Munster in Round 1 while Tigers were beaten by Racing 92 in Paris, claimed a try bonus point of their own with four second-half scores, three from wing David Smith. The five match points, combined with a 14-7 win for Munster over Racing in Limerick, took Tigers to the top of Pool 4 ahead of the head-to-head rounds when the competition resumes in December. Gareth Owen and Valentino Mapapalangi were drafted into the Tigers team in place of Matt Smith and Mike Williams, who is serving a one-game ban, in the only changes to the team from the Round 1 trip to Racing. Sam Harrison returned to the matchday squad in place of Ben White after sitting out the game in France last week. Tigers kicked off and were immediately on the scoreboard with a Ford penalty after Castres had been whistled for a high tackle on Matt Toomua on the 10-metre line. Castres, though, levelled the scores within five minutes after blocking a Tigers exit from a defensive lineout and then keeping the pressure on with heavy runners on the fringes of the ruck. Tigers were eventually penalised and Rory Kockott kicked from the tee. Ford made it 6-3 on 10 minutes when Castres were caught offside inside their own 22 as Sione Kalamafoni and Mapapalangi carried strongly. Castres again went direct at the restart, before Tom Youngs dropped on loose ball inside the Tigers 22 and gained put-in at the scrum as he disappeared below a pile of bodies. A superbly timed tackle from Malouf and Kalamafoni then got Tigers on to the front foot, creating turnover ball and an opportunity for Veainu to counter-attack before Castres again fell foul of the referee’s whistle. Ford struck the penalty down the middle from 35 metres to make it 9-3 on 14 minutes. The first try – and a sensational one from the home side – came from the next phase of play with May again the man with the finish. Ford began the attack inside his own 22 and Owen took play up near halfway, but the breakthrough came from Mapapalangi’s superb offload out of the tackle on the left wing which put Kalamafoni in possession. The Tongan No8 kicked ahead from the touchline and May showed his pace to win the race to the ball, pick up and dive over the line in one movement to bring Welford Road to its feet. Ford’s conversion from wide on the left made the score 16-3 with 16 minutes gone. Owen’s debut lasted only another couple of minutes, though, before he made way for Mathew Tait and the replacement was quickly into the action in attack before Ellis Genge made a run into the heart of the Castres defence which ended with another Tigers penalty. This time, Ford opted to go to the right-hand corner and, although Graham Kitchener made a safe catch and set up a maul with Tom Youngs on the ball, Castres managed to block the push and gained the put-in at a five-metre scrum when the maul went to ground. Tigers were not to be denied for long, however, as a second try arrived from scrum-half Youngs. The move began in the Tigers half of the field again, with Malouf carrying back at Castres, then May and Tait taking play on before Genge made another charge into the opposition 22. With the referee playing penalty advantage, Tigers recycled quickly and Youngs darted through next to the right-hand post. Ford added the kick to make it 23-3. 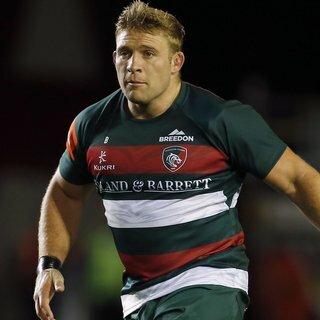 And the home support was in full voice with a third try just moments later, with Tom Youngs making a 50-metre break in possession from his own 22 and then Genge high-stepping his way through and over defenders towards the tryline before Hamilton was cut down just a handful of metres out. But the ball came back again and this time Veainu slipped past his tackler and ran in unopposed on the right. Ford’s conversion attempt hit the inside of the left-hand post and bounced out, but at 28-3 Tigers were three-quarters of the way towards a bounce-point score with just half an hour played. That fourth score came on 35 minutes with Veainu this time latching on to smart work at the breakdown from skipper Youngs before stepping his way to the line, diving in under the posts at the Mattioli Woods Stand end. Ford’s extras made it 35-3. There was no addition to the score before half-time, though Matt Toomua received lengthy treatment for a knock before being replaced by Joe Ford at the interval. 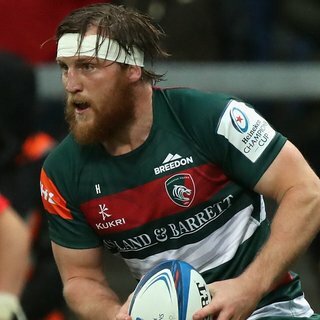 May’s ninth try of the season came just two minutes into the second half – on the back of two minutes of possession by Castres inside the Tigers half. Strong work in defence from Dan Cole created the pressure on the ball and Tait was able to break away, popping a pass for May to run in from 30 metres. George Ford added the conversion as the lead reached 42-3. Tigers were quickly back on the attack, with Malouf making the most of possession on the left, and Kalamafoni stopped just short of the line on the right. but the forwards kept the ball alive at the breakdown and Tait was able to find Veainu on the right to wriggle his way over for the team’s sixth score of the afternoon and his third of a productive afternoon. Joe Ford took over the kicking and thumped his kick from the right touchline but was just wide as Tigers led 47-3. Referee George Clancy also took the opportunity to speak to Castres about their discipline. Ironically, it was the Tigers defence that fell foul of the referee a minute later with Mapapalangi yellow-carded after bringing down a driving maul from Castres which looked bound for the tryline. The visitors got their reward when No8 Alex Tulou came through their driving maul from alineout to score. Kockott added the conversion to make it 47-10 with still 28 minutes to play. Joe Ford provided the scoring pass for Tigers' seventh try, with Malouf working his way to the line on the left for his fourth score of the season and to take the team past the half-century mark. Joe Ford added the conversion to make it 54-10. Mapapalangi returned from the sin-bin with 62 minutes played, but the final 20 minutes saw Castres claim an unlikely bonus point with a hat-trick of tries from Smith. The visitors managed to make the most of spilled ball in their own half to create a score for wing Smith, just getting into the left corner, with Kockott kicking the conversion. It was Tigers’ turn to get through their work in defence and, with a tap penalty providing quick ball, Smith added a second on 72 minutes, just finding enough room on the left and Kockott kicked the conversion as the visitors worked their way within reach of a bonus-point score of their own. Smith then made it a hat-trick with more smart work in the left-hand corner after a lineout drive, though Kockott’s conversion came back out off the post as the Tigers lead was cut to 54-29 with two minutes remaining. Tigers are back at Welford Road in two weeks, Saturday, November 4, when they start the defence of the Anglo-Welsh Cup against old rivals Gloucester Rugby. See you then. 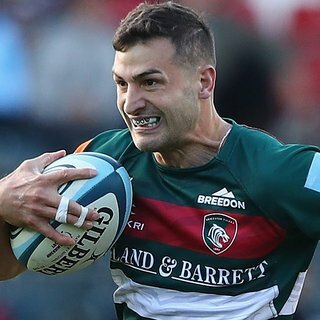 And Jonny May, who scored another two tries this evening, has been voted the Lumbers Player of the Month by supporters. Well played Jonny. And well voted supporters! Telusa Veainu, after his three tries, was the Heineken Man of the Match. It's full-time at Welford Road and Tigers have the bonus-point victory. Tries for Veainu (3), May (2), B Youngs, Malouf. Well done boys. Castres do get their fourth try, and it's a hat-trick for David Smith. He scoops up Kockott's pass off his toes and dives in at the left corner. Castres catch Tigers out with a tap penalty 5m out. Smith sells the dummy and is over for his second try, and crucially Castres' third. About two hours later than forecast, the heavens have opened at Welford Road. In blustery conditions, Kockott lands an excellent conversion from the left flank. Castres punch holes in the Leicester defence before David Smith does brilliantly to hang on with his fingertips as the last-ditch tackle comes in and score on the left. Welford Road rises to acclaim the performance of Ellis Genge, who has marauded around this Welford Road pitch this evening. Brilliant stuff Gengey. He is replaced by Greg Bateman. Mapapalangi, or Tino to the boys, is back on after his yellow card. Tuohy charges down Kockott's attempted clearance but can't cling onto the ball as the defence opens up. The considerable frame Dan Tuohy is on for his first home game for the Tigers. 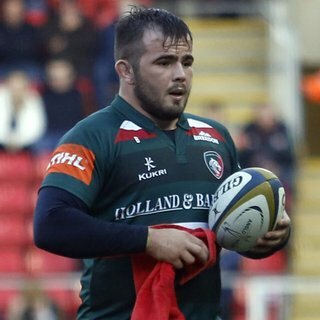 Welcome to Welford Road, Dan. He replaces Kitchener. Joe Ford takes over the kicking duties. And after missing with his first effort, he lands his second to complete the seven-pointer. From Genge's run, Tigers have a seventh try. The Ford brothers combine, with Joe putting Malouf through a hole and over for his first European try. 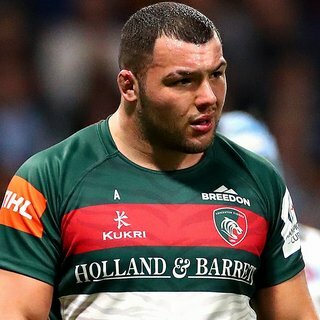 Tigers fans will be coming up with a name for Ellis Genge as he goes on yet another bulldozing run through the heart of the Castres defence. Genge the Rhino? Castres keep up the pressure and eventually find a way over from close range. No8 Alex Tulou is the scorer. Kockott converts. Castres get up a huge head of steam at the maul and Tino Mapapalangi pulls it down. He recveives a yellow card. Tigers lucky not to concede the penalty try. Kalamafoni was stopped short but Tigers kept possession. The ball came back to the left wing where Veainu stopped off the flank and past two tacklers to score. That's two already this half. And a hat-trick for Telusa! May finished the try but it owed much to the quick feet and quick thinking of Mat Tait. He picked up loose ball in the Leicester half and made 40m into the Castres half. As the defender closed he found May's supporting line to finish under the posts. Simple but extremely effective. George Ford with a simple conversion completes the score. The second half is three minutes old and Tigers have a fifth try ... and it's that man May again! The visitors get the second-half going, with Tigers attacking the Robin Hood Stand end. The visitors are out a good 90 seconds before the Tigers, who have replaced Toomua with Joe Ford at the start of the second half. The best half of the season, unquestionably, as Tigers secure the try bonus point before the break. Tries for Veainu (2), B Youngs (1) and May (again). Ford has kicked the rest. There's a hush around Welford Road as Matt Toomua receives treatment after being caught at a ruck ... but the Aussie is tougher than Crocodile Dundee and is back up and running. Toomua and May linked well in midfield, and at the next phase Ben Youngs's dummy run around his brother opened the space for Tom Youngs to throw a basketball-style pass over his tackler to put Veainu through to step past full-back Batlle and over. Brilliant lines and execution. Ford adds a simple conversion for the seven-pointer. This has been a dream first 36 minutes for Tigers. Is that the try of the season? What. A. Try! It's like basketball now. Passes out of the back, over the top and a second for Veainu. And the bonus. ... great work by Luke Hamilton wins the holding-on penalty ... and allows the Matchday Live team to draw breath! It's all go on Matchday Live! It's like PlayStation rugby at times. This time Veainu collects Ford's quick throw and steps past two, three, four defenders before Youngs's kick pins Castres back on their line. The try owed a huge amount to the bowling ball run of Tom Youngs, who somehow went from inside his own 22, bouncing off defenders into the Castres half. Eventually, Castres ran out of defenders and Veainu had a free run to the right-hand corner. The try goes unconverted. That's try number three for the Tigers already. And this time it is Telusa Veainu who goes over. Ford adds the extras. This is a great half from Tigers. All-court rugby from Tigers has Castres in all sorts of trouble. Kitchener, and again Genge, making inroads with brilliant hands from Tait in the middle, to put Ben Youngs over. It has been all Tigers for the last 10 minutes, but Castres show they are up for the fight by halting the lineout drive and getting the scrum put-in. May goes over on the left again after brilliant attacking play from the Tigers. However, Toomua's one-touch pass is judged forward. Play comes back for another penalty that Ford sticks in the corner. Mat Tait is on for an early taste of the action for Gareth Owen. It doesn't look too serious so hopefully a precaution. What a try it was. Ellis Genge's barrelling run gave Tigers momentum, but it was Mapapalangi's offload to Kalamafoni that created space on the left. Sione was still 50m out but his clever kick infield gave May the chance to open his legs, and like a thoroughbred racehorse he galloped onto the loose ball and over. Ford lands the conversion from wide on the left and this is a brilliant start from the Tigers. Tigers have the first try of the game and it's that man Jonny May again! Ford is making light of the heavy winds and kicks his third penalty to move Tigers 9-3 ahead. Sione Kalamafoni's tackle on Armand Batlle is one to watch again on the highlights. Tigers turn over possession and win another penalty. A big hit goes in on Castres prop Mahaita Lazar, who knocks on, and the chant goes up in the Crumbie Stand. 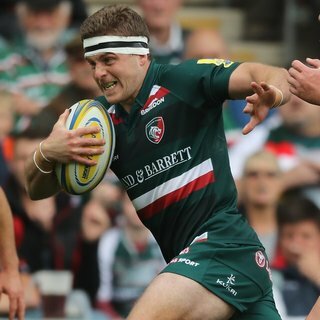 ... it's a simple kick for the Leicester fly-half. Tigers lead 6-3. Good start by Gareth Owen on his first home start, overturning possession on the Castres 22. Castres knock-on and Tigers have the scrum. Rory Kockott kicks Castres level after Tigers go offside in defence. It's 3-3 at Welford Road. Castres big ball-carriers hammer down on the Leicester defence, but Tigers keep them out. Illegally, according to referee George Clancy. Penalty to Castres. Combezou in the thick of it early on, and he is felled by an almighty thwack from Tom Youngs! Tigers consolidate the penalty by exiting their 22 well, with Ben Youngs's kick taking them up to their own 10m line. George Ford kicks off with Tigers attacking the Mattioli Woods Stand end of the ground. 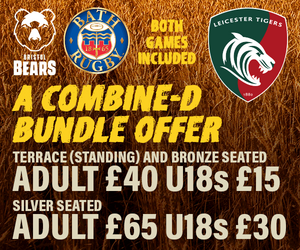 European rugby is back at Welford Road. We're underway for this round two clash between Tigers and Castres. Tigers have also finished their warm-up and great reception from the fans around Welford Road as they head back in for final preparations. Great to see Adam Thompstone warming up with the team before kick-off ... and at the other end of the pitch Steve Mafi is making his first return to Welford Road. Mafi starts at lock for Castres. Warm up is underway for both the visiting French outfit and home side here at Welford Road ... and isn't it necessary, as the chill slowly but surely descends upon all here inside the ground. No late changes to either of the sides name yesterday afternoon have been also been confirmed, as the atmosphere here at this historic venue begins to build ahead of the opening European fixture of the new season. Some very unthreatening clouds are hovering above the Welford Road venue at the moment, while the wind is slight but not over-powering. One thing that looks better than ever is the beautiful pitch here, as it has all season, with the green shining like a diamond ... if such a diamond does exist! Expect some expansive and exciting rugby today, especially with the sides named yesterday from both coaches including plenty of attacking power from scrum-half to fullback. What a sight it is ... European Rugby flags flying again at the historic home of two-time Champions, Leicester Tigers. Welcome back to those joining us for today's Champions Cup fixture on mobile devices, whether it be via your Tigers Mobile App or on the club website. We'll be bringing you all the latest news ahead of today's 5.30pm kick-off, including the confirmed matchday squads from both Tigers and Castres around one hour before we get underway. 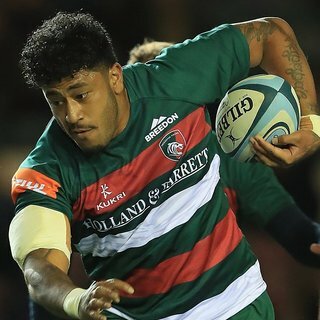 Gareth Owen and Valentino Mapapalangi have been drafted into the Leicester Tigers line-up for Saturday’s European Champions Cup game against Castres Olympique at Welford Road (5.30pm). Owen is in line to play in his first Champions Cup tie for the club after previous appearances in Europe with Ospreys and Scarlets, replacing Matt Smith at centre this week. Back-rower Mapapalangi is involved for the first time at this level as he starts in place of Mike Williams who is serving a one-match ban after the Round 1 fixture against Racing 92 last weekend. These are the only two changes to the starting line-up from the Pool 4 trip to Paris last Saturday, during which Tigers claimed a bonus point in a 22-18 defeat. Scrum-half Sam Harrison returns to the matchday squad and is named among the replacements alongside internationals Pat Cilliers, Dan Tuohy and Mathew Tait. “The point we gained last week will be important in the mix,” said Tigers head coach Matt O’Connor. “The draw between Castres and Munster keeps things really tight so there is everything is still to play for. 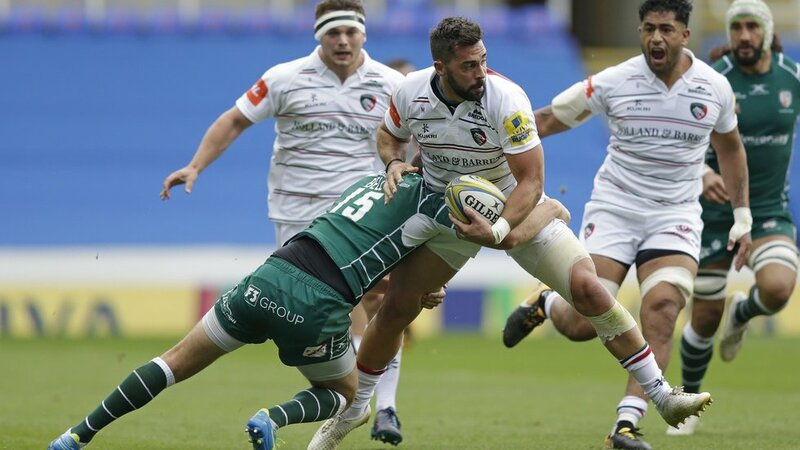 Leicester Tigers and French visitors Castres Olympique meet for the first time in more than 20 years of European Cup rugby at Welford Road tomorrow with both sides chasing a first win in Pool 4 of the Champions Cup season. Tigers, in the club’s 21st season of elite European rugby, opened the campaign with a bonus point in defeat away to Racing 92 last Saturday and face a French double with the visit of Castres who draw at home to Munster in Round 1. Head coach Matt O’Connor said: “We have to improve and take our game to another level this week at home and if we can do that there is the making of a really competitive unit there. “Castres have a big and physical squad, they’re confrontational in the collisions, they are very direct. They’re seasoned campaigners, they understand how to break down teams. 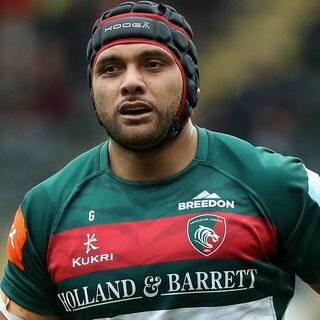 Castres, French champions in 2013, have qualified for the European Cup in seven of the last eight seasons and include former Tigers favourite Steve Mafi in their line-up for Saturday. Benjamin Kayser, Horacio Agulla and Seremaia Bai are three other Tigers who have worn Castres colours in recent years and, although the teams have 222 appearances in the European Cup between them, this is the first time they have met in a competitive fixture. Team give a European debut to back-rower Valentino Mapapalangi and bring Gareth owen into the line-up at centre in the only two changes to the team that started against Racing. Referee for Saturday is George Clancy of Ireland.